…you might want to think again! This is another image from Ruth’s collection. 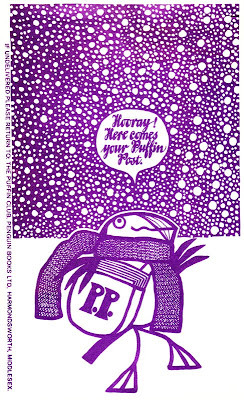 These wonderful one colour pictures were printed on the envelopes that contained the precious copies of Puffin Post when they landed on your doormat. It certainly left you in no doubt as to what had arrived. As always, these were drawn by Jill McDonald. Having now seen some examples of Jill’s original work, I have begun to get an idea of how she worked. All of the beautiful line drawings that appeared in Puffin Post appear to have been drawn without guide pencil lines and drafted straight onto what looks like layout paper. Those of you with a background in old fashioned graphic art will know what that means! However she worked, I have yet to find a piece of her work that isn’t beautifully proportioned and carefully considered.